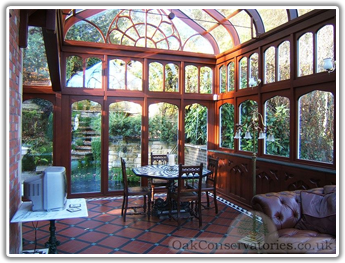 I hope you find our Gallery of Orangery and Conservatory Photos as interesting and exciting as we did carrying out the projects for our clients. Our Gallery is divided into eight main areas, the first six devoted to hardwood (primarily seasoned oak) and which represent the four main types of timber glazed extension, plus Porches, Windows and Doors. 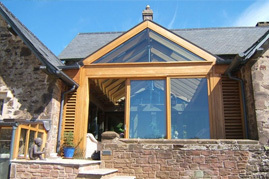 The latter two being PVC and aluminium conservatories, windows and doors. 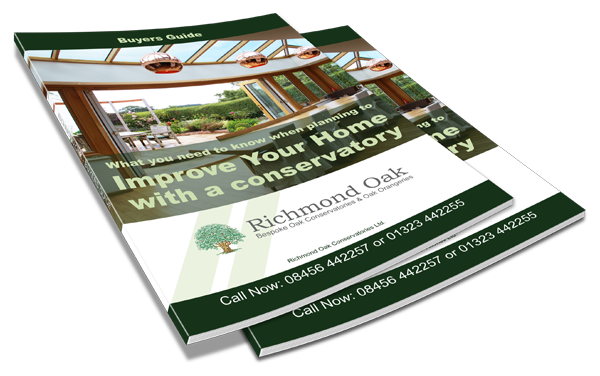 Traditional Conservatories have predominantly fully glazed roofs and are available in many styles, having single pitched, gabled or hipped roofs of many designs. 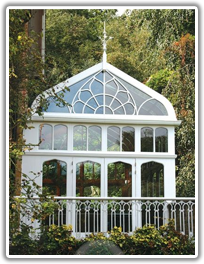 Some call the octagon or multi-facetted ended conservatories ‘Victorian Conservatories’ and hipped roof conservatories ‘Edwardian Conservatories’ albeit questionable categorisations. 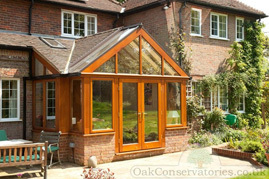 All oak conservatories from Richmond Oak are manufactures and glazed to the highest standards with internal glazing beads. Garden Rooms have predominantly tiled or slate roofs, frequently with a gable design to throw the light back into the rear of the extension and the room behind. All Richmond Oak garden rooms are manufacturesd and installed to meet the highest Building Regulations standards. When considering a garden room, you should take into consideration the reduction of light in the room to which it is attached, as this is the main reason why many choose a solar control glass roof instead. 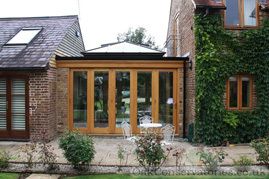 Orangeries have part flat roof and one or more glazed lanterns, usually of a classical design, but Richmond Oak do now offer some very contemporary oak Orangery designs. 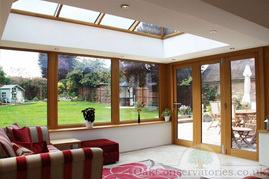 An orangery provides more of a room like appearance, usually with more brickwork or heavier timber posts. 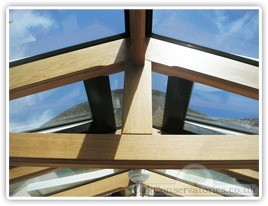 The traditional orangery roof construction from Richmond Oak always have structural calcs to meet Building Control standards. 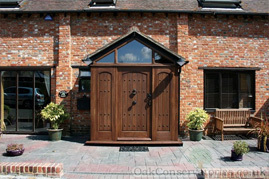 We are able to custom design and install an oak glazed porch or ‘boot room’ to suit your home. 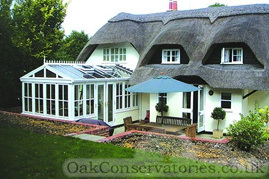 Richmond Oak porches are constructed to the highest standards with a choice of glazed or solid roof. 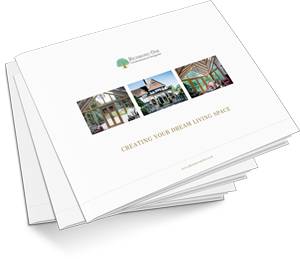 Whilst we specialise in seasoned oak construction, we are able to supply in a choice of different hardwoods to suit the property and meet our client’s requirements. 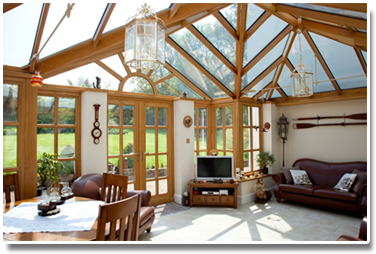 Once we have installed a conservatory for our clients, many of them have asked us to manufacture and install oak windows and doors to match the features of their conservatory. 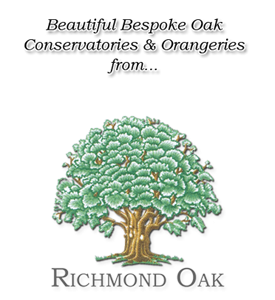 Richmond Oak custom design our window frames to meet the particular requirements of the property. In addition to oak, we are able to provide windows and doors in a variety of different timbers, and a choice of pvc or aluminium. Generally speaking most of our enquiries for aluminium are stimulated through Architect’s advice. Once again our Hallmark Conservatories Division is able to produce almost any type of aluminium glazed structure, aluminium bi-fold doors, aluminium sliding doors, aluminium windows and doors, plus an exciting range of ‘slimline aluminium windows’ designed to emulate the metal frame, Crittal Windows of the 1930’s. 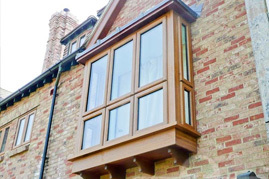 We can also provide aluminium windows set in new seasoned oak subframes typical of many quality homes built pre-war, frequently having black windows with leaded lights. No two Richmond Oak glazed extensions are the same, so if you don't see a design similar to what you require don't think we are unable to provide it. We pride ourselves in producing buildings to exceed the aspirations of our clients and provide a 'Wow!' environment to their home. We are able to model the proposed design for your home in 3D. Whilst the same software allows us to superimpose the model onto a photo of your home, at the same time it calculates accurately the price for carrying out the work. Please don't hesitate to contact us for a Free, no obligation site visit and detailed proposal for your own home. We have a team of experienced designers and are able to provide a supply and fit service throughout most of the UK and supply only throughout the world. If the project substantiates it, in some cases we can provide a supply and fit service Internationally. ​​Peace of mind in both our quality of build and service plus if something should happen to us, that your investment is secure and the project will proceed. Richmond Oak is a proud partner of Pegasus Finance. Pegasus help our customers take charge of their finances with their quick and easy five star rated loans. Submit your details below and we'll rush our Buyers Guide to your email address.